I should apologise yet again (why break the habit of a lifetime? ), for my lack of blogging in recent weeks. It is due, principally, to two reasons: exams, and the Couchsurfing Project. For those of you wondering what the Couchsurfing (CS) Project is, I shall explain, since I’m not in the mood for talking about exams. The basic concept is that it is a network of people who wish to see the world and become better acquainted with its peoples, places, cultures and languages. These can be broadly divided into two groups, membership of which is interchangeable with respect to time. The first consists of those who are currently travelling, and wish to avoid the expense and tedium of staying in hotels, preferring instead to experience a city through the eyes of a local; the second group is composed of those who are, at least temporarily, settled somewhere, and have space on their floor, a spare room, or a garden with space to pitch a tent. I’m sure that by now you can see were this is going: members of Group A get in touch with members of Group B (based on anticipated compatibility informed by their profiles) with a view to spending some rent-free time their destination city of choice. Of course, individual arrangements vary, in terms of duration and in terms of what each party expects from the other. For example, when a German and a Berlin-based American guy got in touch begging for help because they’d been stood up, I felt sorry for them and let them stay for three nights on the understanding that they’d keep out of my hair (since I was trying to revise for imminent exams), and cook a meal for me and my friends. As it happened, it was an arrangement which worked very well! I had my first CS experience before I had actually signed up: a Belgian friend of mine had agreed to let an American couchsurfer stay, neglecting to account for the fact that his girlfriend would be staying the weekend! I, of course, offered to help out, got on very well with Adrian, my guest (we still see each other once every couple of weeks), and decided that this couchsurfing lark looked like fun. Which it has been! Being a somewhat difficult topic to illustrate, I struggled to seek out a suitable picture. 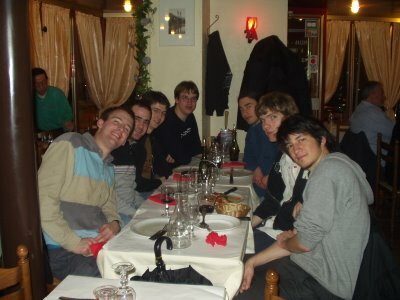 However, I did find this photo of Adrian (front right) and I with the gang in La Pentola, our favourite, closest and cheapest pizza restaurant. One moment I had to capture and share with you was the warning given to me by the CS system that there may be a language barrier between a potential guest (whose language competencies are shown below) and myself. Green typeface indicates a common language; suffice it to say that that the grey font indicates that the system sees no compatibility between my native tongue and English (United States). Having finished studying and then having worked for a bit, I decided to (finally) pursue my dream, and bought myself a round-the-world plane ticket. Never being one to like to plan too much, I'm basically making it up as I go, and travelling alone permits the flexibility to do that, which is fun! I like meeting new people, going to new places, and learning about other cultures. In the past, I have found myself naturally gravitating towards cities (especially ones which tell a story, like Paris, London and - most recently - Buenos Aires), but I feel that I need to learn to spend more time exploring the natural beauty this planet has to offer, before we succeed in destroying it.